The Cibola High School teacher, who allegedly made a culturally insensitive remark to a student and snipped another student's hair, is no longer an employee of the Albuquerque Public School District. According to the district, they severed ties with the teacher on Nov. 30. APS Superintendent Raquel Reedy reached out to the students to let them know the teacher wouldn't be returning. The ACLU of New Mexico released a statement to APS Superintendent Raquel Reedy regarding the teacher violating multiple rights of the two Cibola High School students. The statement thoroughly reviewed the incident and emphasized the harms inflicted on the students. In a different statement, APS said it values diversity and has a rich history of inclusion. The ACLU of New Mexico released a statement on Wednesday to APS Superintendent Raquel Reedy regarding a teacher violating multiple rights of two Cibola High School students. The teacher, identified as Mary Jane Eastin, has been placed on leave for allegedly making a culturally insensitive remark to a student and snipping another student's hair. The ACLU statement thoroughly reviews the incident and emphasizes the harms inflicted on the students. 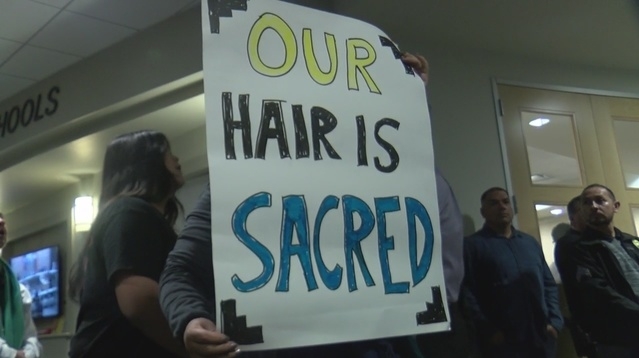 Responses to "Teacher no longer works for school after cutting Native American student's hair"
I find it offensive that the word "controversy" is used in this situation. How can it be controversial? People actually support the monster of a teacher? What a shame! The proverbial 'Pandora's Box' of classic xenophobia and racism had been opened in the 2016 election. Since then, people with th ou ae tendencies have been coming out of the woodwork! So good that the district took the appropriate action. This teacher should never teach again...anywhere in this diverse country were minorities reside! The school should be shut down as well. I cannot help but feel that whites in the US should only be allowed to teach and police (and I wish judges/juries as well) in predominantly white areas! The only exception is when they marry and live in the communities they normally oppress. For once, they need to be the ones banished to certain areas. This is outrageous. Should be. Considered assault and as well.agree, she or anyone else should be prosecuted, not just fired. The racism and the fact that it took so long for action on part of the school says much about the community. If the Native people did not speak up, you think the school would have done the right thing? The Teacher committed an assault. There is NO excuse for what she did and said to those students, and ANY teacher that teaches to students of different backgrounds, needs to get some education themselves before being allowed to teach them! And as for the ones bashing whites, talking about racism - YOU’RE BEING RACIST BY SAYING SUCH ABSURD THINGS. Grow the hell up. The only thing that seems to work in changing the behavior of the oppressor is to be fired. The financial and professional consequences are the only factors demonstrated to effect behavioral change. Sure, it would be nice for there to be a change in attitude and beliefs but those changes tend to be linked to the situation whereas, if a person realizes that there will be consequences behavior changes. Regardless boy or girl, they shouldn't be treated that way, A person has the right to have long hair or short. I grew up having long hair as a pre-teenage boy, after growing it out when I was 10 years old and never wanted to cut it again because I liked it long and refused to cut it when I was a kid. Today I still feel the same way. In what universe does a "teacher"(and in this case I use the term loosely)have the right to touch a student, let alone CUT a student's hair? She should not just be fired; she should face a lawsuit, and never be allowed near children again! That is a gross act of personal assault! "the judge abused his power by imposing the fines"
"riders who abuse their horses should be prosecuted"
But was she charged for assault causing bodily harm?